K.K. Downing - "To Concentrate On My Golf Course Is Not, And Was Never The Reason For Not Doing The Latest Tour With JUDAS PRIEST"
"I think Ken had just had enough. He'd got a lot on his plate with his golf course and I think he couldn't spend the time away." "The word think depicts uncertainty; therefore it lends itself to supposition. I love Ian as a brother and nothing will ever change that, but his take on the situation in this instance is inaccurate, and the people from the press had no license to jump in and take what they thought was a cheap scoop out of what Ian thought the situation was. To concentrate on my golf course is not, and was never the reason for not doing the latest tour with Judas Priest. I have had in place since last September the world's leading golf Management Company known as Troon Golf. Troon manages approximately 200 facilities world-wide; please see the facility directory at Troongolf.eu. The course has been open and running smoothly since last September when it hosted a great charity event for the Lords Taverner's in aid of underprivileged children. 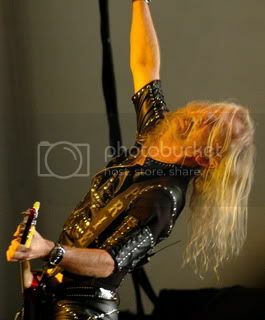 Anyone that has ever known me will testify that I have always been dedicated to Judas Priest and the fans, and nothing has ever stopped me from touring until now. I have been busy going to concerts, metal exhibitions, trying to help younger bands to get off the ground, and have plans to travel on business to other countries including Finland, Spain, and the US this summer. As for stepping out from Priest before the tour, I stand by my original official statement on the matter. Although I am not there I wish for the name Judas Priest to forever be triumphant, I have no doubt the Epitaph tour is sensational, I therefore urge you all again not to miss out this one, so please give your best support one more time to the mighty Priest."